In conjunction with the Gas Machinery Research Council, Wood (BETA Machinery Analysis) has developed the damped vibration absorber (DVA). This rugged absorber is ideal for existing compressors, pumps or piping systems experiencing high vibration due to resonance. It can also be installed at the design and construction stage to avoid a known resonance problem. Major operators rely on Wood's vibration absorber due to its long-lasting effectiveness, ease of installation and low cost. For more information and to order, email us today or call (+1) 403-245-5666 (UTC-07:00). The damped vibration absorber (DVA) can be applied to vessels, piping, and other locations that are resonant. For reciprocating compressor packages, a common application is near the top of resonant scrubbers or piping near coolers or PSVs. As the name implies, the DVA absorbs vibration using a tuned mass/spring configuration. The unit won’t fail from excessive vibration, nor will it need any maintenance. It can be installed “hot,” an important advantage for many operators. Although new to the market, the vibration absorber is based on well-known physics. It has been developed in conjunction with a reputable partner (GMRC) and has been built, tested and proven to work. At resonance, the DVA will cut vibration to lower levels. In many cases, the vibration amplitudes are reduced by 50%. The goal of the device is to reduce vibration to acceptable levels – not entirely eliminate vibration. The unique feature behind the DVA is that it has an extremely long life and will not fail due to excessive vibration. The design has no stress concentrations; this ensures a reliable, long-lasting solution to heavy duty industrial applications. The vibration absorber unit is tuned to the target frequency – to achieve maximum performance. 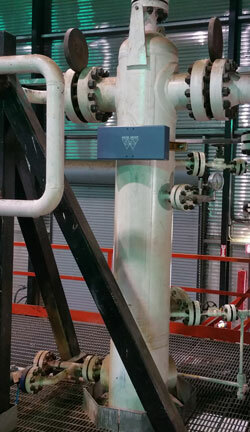 By comparison to other vibration solutions, the total cost of applying the DVA is small. 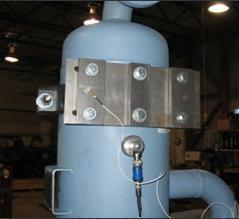 No modifications are needed to the piping, vessel, or skid. No supports are required. The unit can be installed quickly in minutes, with no special tools or equipment. Can be installed “hot” – avoiding the need for equipment shutdowns. Easy to size the unit. For application assistance, contact us. For more information and to order, email us today or call (+1) 403 245 5666 (UTC-07:00).